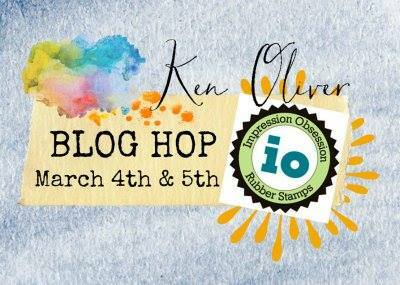 Dina Kowal Creative: Ken Oliver Crafts / Impression Obsession Blog Hop! 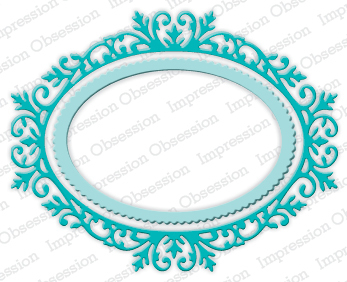 Ken Oliver Crafts / Impression Obsession Blog Hop! Welcome to the Ken Oliver Crafts/ Impression Obsession Blog Hop! Our teams have joined together for a two-day product showcase... I hope you'll take a peek at the projects everyone has made yesterday and today - all the links and hop details are below. Also, remember to comment for a chance to win! I have a pile of brand new dies on my desk, so I was eager to play with a few - I also was sent a package of Ken Oliver's Stick-It adhesive sheets, which I've seen and heard about, but hadn't had the chance to use. I thought these detailed dies would be a great test run for this magical adhesive. It worked perfectly, just as promised - it's applied to the cardstock before cutting, and it's so thin that it just adheres perfectly to the die cut when it's removed, even with all these detailed cuts. Love it! Another new hero on my desk is this light pad - it came with a grid, and that has been so helpful for centering and lining up layers. The Ornate Oval Frame has some nested layers, so I switched out the center piece for a bit of watercolor paper I decorated with 2 of Ken's newest Color Burst colors - Merlot and Burnt Orange. Gorgeous earth tones, and so much fun to layer. I sprinkled small amounts of the powder onto a craft sheet, then spritzed water and laid my panel into the color, drying with a heat tool between layers. I used a little Copper Liquid Metal in there too! The Cross dies are new as well - they're simple and elegant, and layer well too - and again, so easy to adhere with Stick-It. The sentiment comes from the Easter Basket clear set. Be sure to visit the designers below for a chance to win 4 great prizes - Ken Oliver Crafts will be giving away 2 sets of Color Burst and Impression Obsession will be giving away two $25 Gift Certificates. Winners will be drawn from blog comments, so the more love you leave, the better your chance to win! Comment entries will be open until 9pm EST on Sunday March 6 and all winners will be announced Monday March 7. Dina Kowal ---------------------- YOU'RE HERE! I love this cross die set. It is so elegant and is quite beautiful. Love your card as always, Dina. You are an inspiration! Beautiful card!!! Thanks for the chance to win!! Beautiful card - love the dies and the colors! So pretty and a perfect Easter card! Using the white over the orange background gives such stunning results. Its beautiful! I am loving ALL the products you used today! Plus, your background shows off that beautiful cross perfectly. LOVE! Wow love the idea of a light with a grid, and the background you have made is stunning. A beautiful meaning card for Easter. I love your card and have been looking for a card that was more religious than cute. Love this die cut & your color technique behind the cross. Wow! Your card really has an impact! Dina, your card reminded me of the song, The Cross is Enough! I love the way your small background makes a beautiful contrast to its elegance!! I think I have to get some of that Stick-It! Gorgeous card. Love the combination of the Color Burst background with the elegant white die cuts. Gorgeous card with an elegant look! I love the beautiful dies and the color! What a stunning die and resulting card. I joined this hop just to see the 'liquid metals' in use. Awesome! Elegant, simple and pure. Gorgeous. Will have to check out the Stick-It adhesive. I have a package of those adhesive sheets, though I have yet to try them. Thanks for the inspiration. What a fantastic combination of IO's layered dies, stamps and the beautiful Color Burst colors! Thanks so much for sharing the use of the new products! lovely card, dina! i have to get into the habit of pulling out my stick-it sheets! i don't know how many times i have cut an intricate die and smacked my head...ack! i forgot the adhesive! lol! Stunning. Your combination is perfect. Thank you. Beautiful creation! Totally reminds me of stained glass! Well done! I could sure use one of these light boxes. Mine is homemade and doesn't have a grid. Another great background. Thanks. Very pretty. Those dies are great. Love the beautiful background behind the cross. Love the oval frame. Amazing project! Beautiful backdrop for the cross. A lovely creation!!! I am so anxious to try the Color Burst products!! I'm already an IO fan so I appreciate the chance to see the Ken Oliver products in action as I have only heard of them up to this oint. Hi Dina, I love your card, so elegant. The cross dies are lovely! Beautiful! The background colors are gorgeous and perfect with the white elements. I love it! That die is awesome too! Dina...Your card is just really ELEGANT! (Love the frame die and cross) And.... all the different colors that show up in the middle are GORGEOUS! Nice! Oh and I loved hearing about the tools you are working with...Love the idea of the light pad too! Thank you!!!!!! Gorgeous card! Thanks so much for sharing it!! Gorgeous! I'm just waiting for the "Liquid Metals" to arrive at my local shop. Lovely Color Burst background behind your cross dies. Nice combing of different shapes, making multiple layers and textures. Super card.Thanks for sharing. I am truly in love with this cross die cut and it looks so amazing with vibrant colors behind it like a piece of stained glass. Its so Eastery with the oval die cut behind the cross! Nice job! What a lovely cross - thank you for sharing the significance of Easter with this beautiful card. I just came from the Mesa (AZ)stamp expo, and had a chance to watch a Ken Oliver demo - what fun! I like the colorful background for this beautiful cross. Beautiful Easter card. Wonderful dies. Beautiful card. Love your use of the dies. Ooohhhh - I have the ornate oval on order !! I can't wait to try it out !! Thanks for the beautiful idea. I LOVE the all white card with the pop of color. Fantastic! I absolutely love the color behind the cross. It makes the whole card pop! Beautiful Easter card love the background and the all white front. So pretty! Amazing card. The color is just perfect. really nice contrast between the white and the colors... beautiful! Pretty! I'll have to try that adhesive paper, sounds good! Love this card. I love that it is all white except the part where jat has the color burst! Looks like a beautiful one of a kind stained glass window. Beautiful. Wow! That background oval is stunning! Those colors are great together! Pairing the die with Color Burst was a lovely idea! Really enjoy the effect of the cross with color burst! Wow! This card is gorgeous. I own the Ornate Oval Frames but I really want the cross dies now. I haven't seen them in my local store so I will have to research and request them to be ordered. I can see also that those colors are divine. . . have a few but none of the new ones so that's going to be on my list now too. Thanks for such a beautiful card and the inspiration! Absolutely astounding! Gotta get those cross dies and the new colors in color bursts. Thanks for the gorgeous card. Love the colors. Great job Very inspirational!! You make this look SOOO easy! Such a beautiful Easter card. The background is a great color. Loved the card! And I could actually see that splash of liquid metal. Stunning card, it is so dramatic with the white contrasting with the beautiful coloured oval, love it! So beautiful and elegant. Perfect for Easter. Beautiful card! Nice to know about the adhesive sheets. Always love your work! :) Thanks for sharing. This is just so beautiful! I love the effects of Colorburst. Lovely card. The Color Burst in the background really draws your eye to the focal point of the cross. Absolutely Gorgeous! AWESOME! I absolutely love how the Color Burst moves and blends!